We can now offer for sale parcels of assorted world gold coins. Each parcel will contain a selection of interesting gold coins from different countries. These will be real gold coins, not modern bullion coins such as krugerrands. All coins supplied would be at least 90% pure gold, others would be 22 carat gold (91.66%). Buying one of our instant collections gives you the advantage of getting an instant collection at bullion or near bullion prices. The average price in bullion grade will be about 10% over the spot or intrinsic gold price, because we charge the whole collection at fine gold price, whereas the average purity of the coins will be about 91%. Save between 5% to 50% by buying in bulk, compared with buying individually. Every instant collection parcel will be different, depending on our stock at the time, but every coin will be a different type, and there will be no duplicates, as far as possible. The table below shows a typical example of a large parcel. There are 30 coins from 17 different countries. This example is close to the maximum limit before there will be any duplication. It is possible for us to improve upon this by including, for example 7 different types of British sovereigns instead of just 1, and similarly for some of the other countries. We can usually supply between 30 to 40 different coins, with a total weight of between 350 to 400 grams before duplication. Our minimum order for instant world gold collections is £2000, and we can supply any size parcel up to about £12,000 without duplication. We are happy to accept orders for any size parcel, simply choose the amount you wish to spend. Once we reach the duplication threshold, we will keep duplication to a minimum, so you will not receive 10 of one coin type and only 1 of all the others, but for very large orders, the exact selection will depend on our stock levels of each coin. Grams = Nominal gross weight in grams. All coins would be in normal acceptable bullion grades. This varies with the age of the coins. 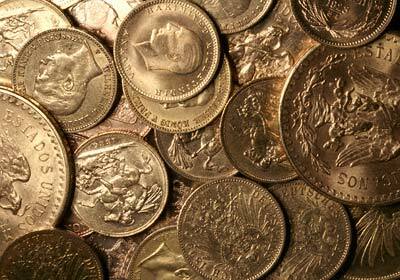 We can also supply coins in selected grade, at 5% above bullion grade prices, or extra selected at 10% above bullion grade prices. At spot gold price for fine gold. Saving about 5% to 15% compared with buying individually. At 5% premium above spot fine gold. May also contain a greater selection including some slightly scarcer coins in bullion grade. Saving about 10% to 30% compared with buying individually. At 10% premium above spot fine gold. May also contain an even greater selection including some slightly scarcer coins in bullion or selected grade. Saving about 20% to 50% compared with buying individually. Post your order with a cheque, we will calculate the price according to the first London Gold Fix after receipt of your order. As the exact value of each parcel will depend on the exact selection available, make your cheque for the desired amount. As it is almost impossible to make each parcel to an exact amount, we can either send you a small refund, or invoice you for any slight excess. You can tell us which you prefer.